What Day Of The Week Was May 10, 2005? 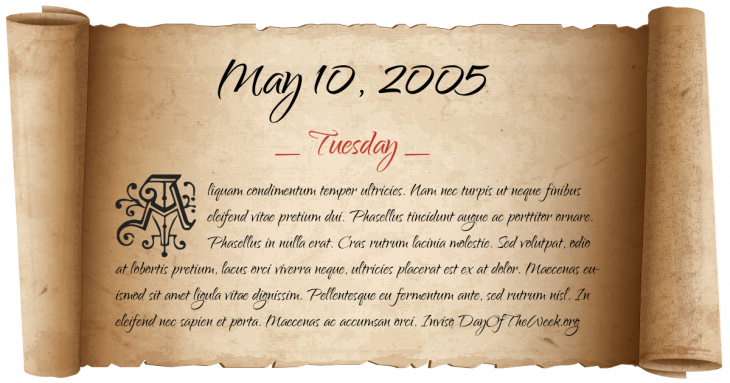 May 10, 2005 was the 130th day of the year 2005 in the Gregorian calendar. There were 235 days remaining until the end of the year. The day of the week was Tuesday. A person born on this day will be 13 years old today. If that same person saved a Half dollar every day starting at age 6, then by now that person has accumulated $1,451.50 today. Here’s the May 2005 calendar. You can also browse the full year monthly 2005 calendar. A hand grenade thrown by Vladimir Arutinian lands about 65 feet (20 metres) from U.S. President George W. Bush while he is giving a speech to a crowd in Tbilisi, Georgia, but it malfunctions and does not detonate.